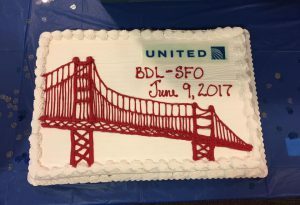 United Airlines’ inaugural flight from Bradley International Airport to San Francisco International Airport (SFO) took flight on June 9th at 6:25 AM, marking the beginning of the seasonal service. The service utilizes an Airbus 319 with 128 seats and will run through September 4th. The outbound flight leaves Bradley at 6:25 AM (ET), with an arrival at SFO at 9:50 AM (PT). The inbound flight departs SFO at 10:45 PM (PT), with an arrival at BDL at 7:06 AM (ET) the following day. Customers can book these tickets at www.united.com. 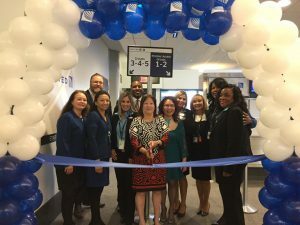 Passengers traveling on the inaugural flight were greeted by a welcome reception at the gate, which included complimentary coffee, refreshments, and giveaways, and they were sent off with a water cannon salute. The San Francisco route is United’s sixth nonstop destination out of Bradley. United’s other routes include Chicago, Denver, Houston, Newark and Washington D.C.